After filling up on some burgers and tacos, Josh and I headed over to the Hasbro showroom where we would spend the next few hours absorbing all the information they had for us. They started off with what they said was no specific order, but of course Transformers was the first topic. While there was tons of exciting new stuff ahead that will please most fans, the question on most fans mind was "Why were First Edition Prime figures cancelled?" According to Hasbro, there was a distribution issue on their part where they could not deliver product. There is a light of hope, however, as they plan to issue those molds in some way in the fall of 2012. So all is not lost. If you must have the First Edition packaging, however, you know where to go spend your hard earned money. 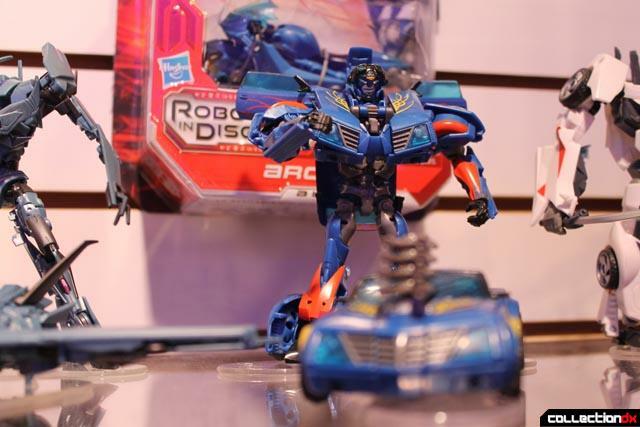 They spoke about the new Prime 'Robots in Disguise' figures, which will cover the whole market by March 1st. 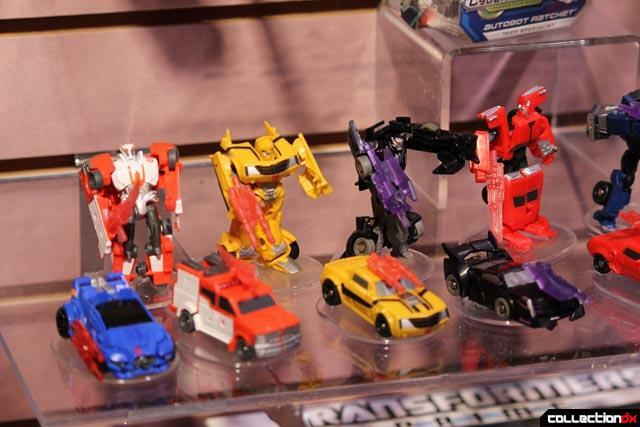 First wave covers Bumblebee, Wheeljack, Cliffjumper, and Soundwave. Here's a preview of what was shown. 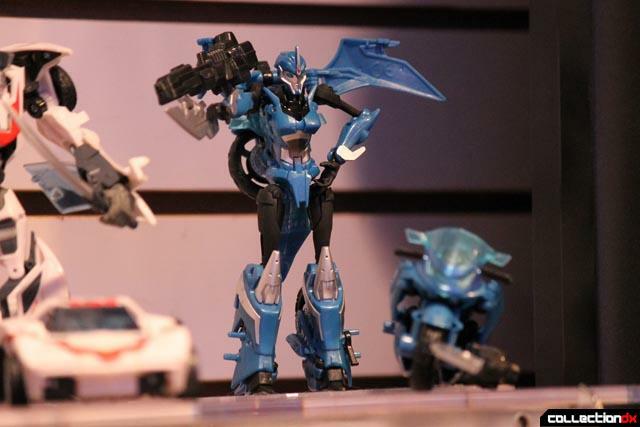 Wave 2 will cover Ratchet and Arcee. 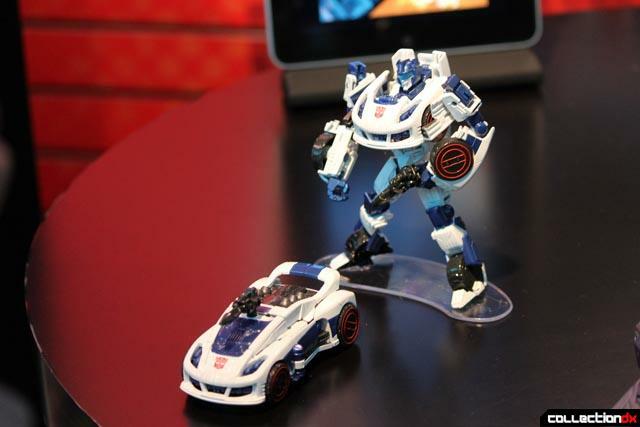 Wave 3 comes to us with Hotshot and Vehicon. 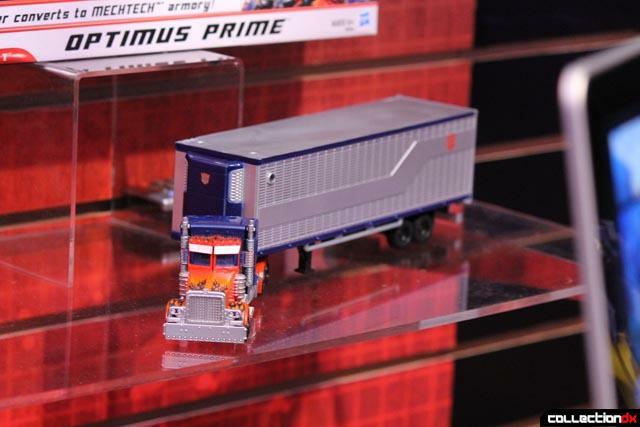 Voyager Wave 1 hits us with Optimus Prime and Megatron. 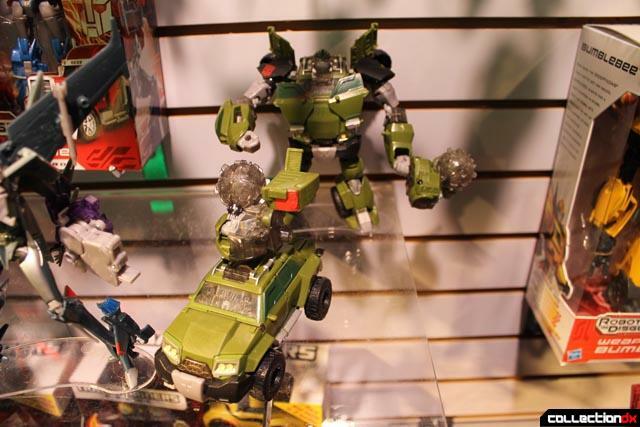 Wave 2 of the Voyager line drops Bulkhead into the mix. 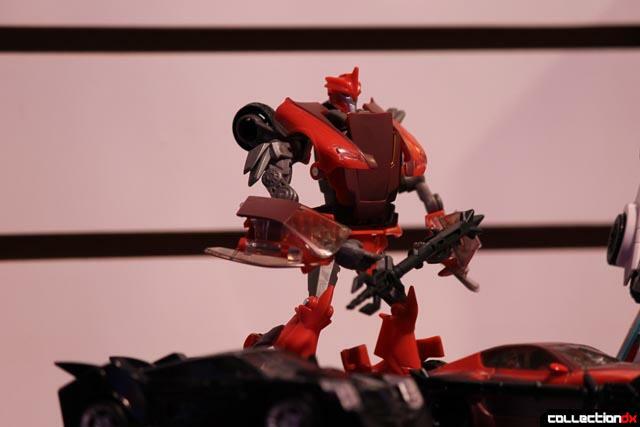 Fall of 2012 will bring us RID Weaponizers with "Weaponizing Action" and Stealth robot and vehicle mode. 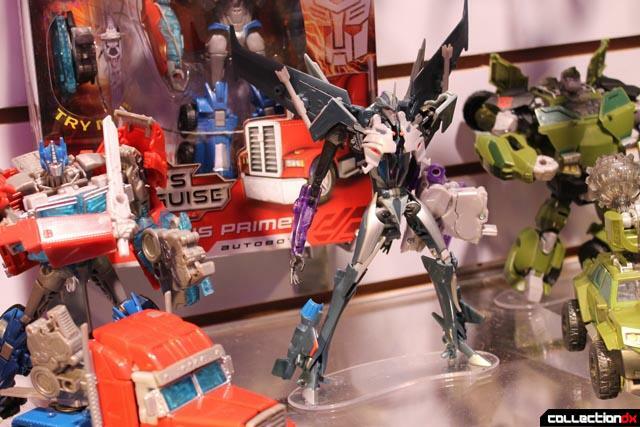 Also shown were some movie trilogy figures and some Asia exclusives like Prime Entertainment pack Bumblebee and Starscream. 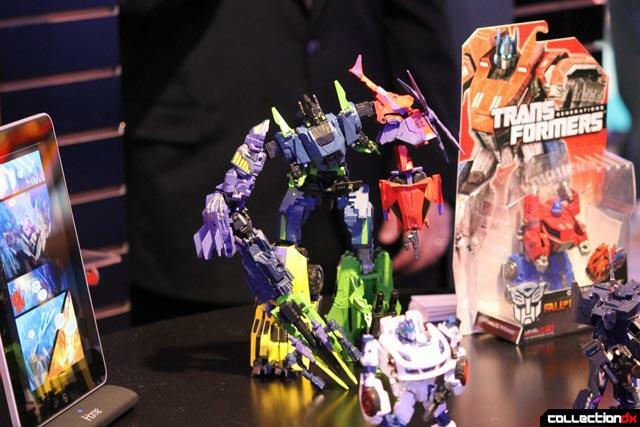 For all you combiner fans, they showed of Bruticus, which is coming out with Wave 2 of the Generations line. The best news of all is that 2013 will continue with over 40 more Generations figures! An interesting Transformer crossover they showed was the Shockwave H.I.S.S. tank with Destro and B.A.T. from the G.I. Joe line. 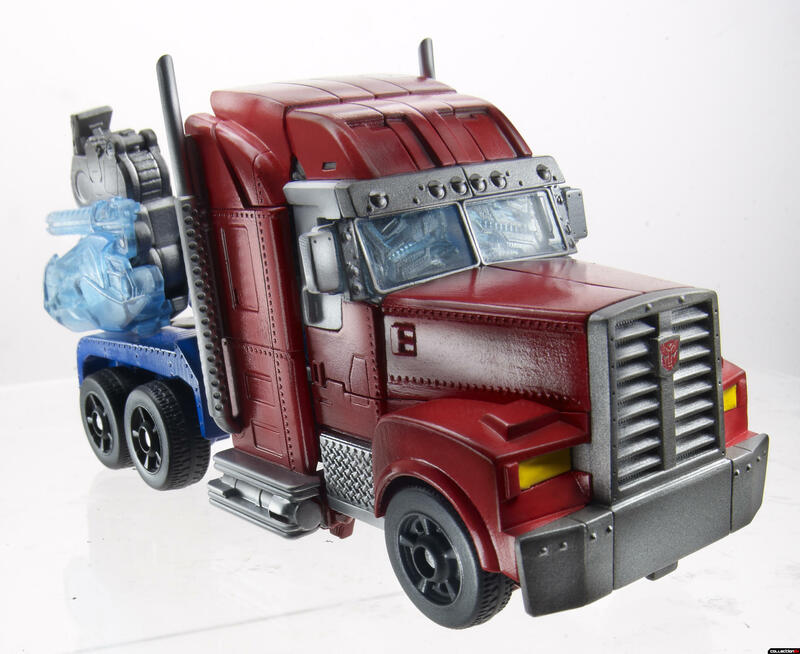 The tank and Destro come outfitted with Decepticon purple coloring along with some classic Decepticon faction logos. This set will include a briefcase full of money and a small non-transforming G1 Soundwave with cassetes. Of course this will be a Comic Con Exclusive. Here is Hasbro's own press release concerning the figures. Collect ‘em all, Crash ‘em all! Introducing TRANSFORMERS BOT SHOTS, a whole new way to play out TRANSFORMERS battles. Available in favorite characters, fans can choose their power, crash into battle and defeat their opponent. TRANSFORMERS BOT SHOTS automatically convert when you crash ‘em! Collect ‘em all, Crash ‘em all! Introducing TRANSFORMERS BOT SHOTS, a whole new way to battle with Transformers. 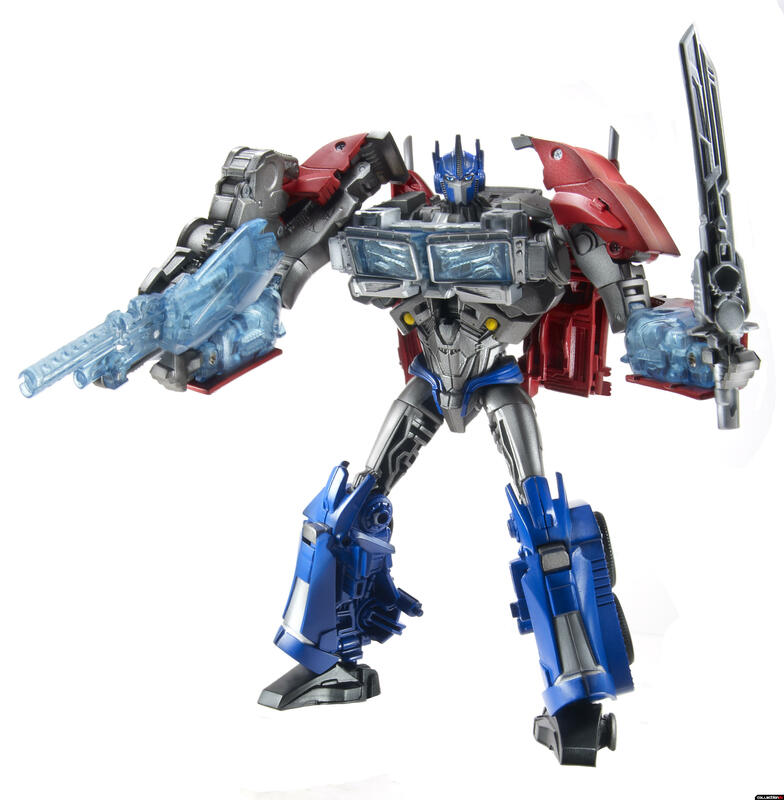 Available in your favorite characters like OPTIMUS PRIME, BUMBLEBEE, STARSCREAM, BARRICADE and SENTINEL PRIME, fans can choose their power, crash into battle and defeat their opponent. TRANSFORMERS BOT SHOTS automatically convert when you crash. 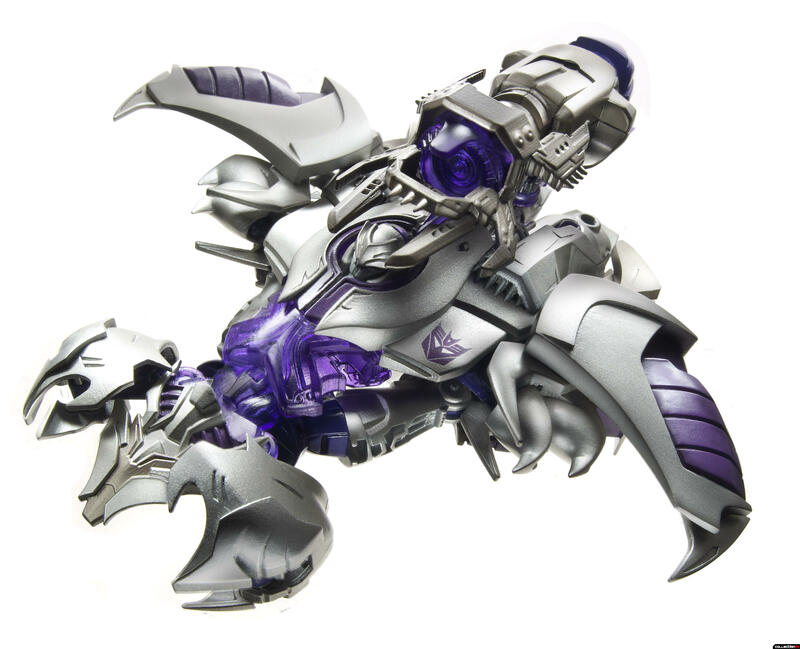 Search for the Super Bot Chase figures that have higher powers and a cool clear look. Sold one per pack, fans can collect all 24 BOT SHOTS in this assortment and 44 across the BOT SHOTS product line. The TRANSFORMERS BOT SHOTS 3-PACK allows fans to build out their collection for even more collect ‘em and crash ‘em fun. TRANSFORMERS BOT SHOTS is a whole new way to battle with the TRANSFORMERS brand. Choose your power, crash into battle and beat your opponent with your favorite TRANSFORMERS characters. The TRANSFORMERS BOT SHOTS 3-Pack Assortment contains 3 characters for battle. The TRANSFORMERS BOT SHOTS Launcher Assortment comes with one TRANSFORMERS BOT SHOT and one launcher to launch your favorite character into battle. 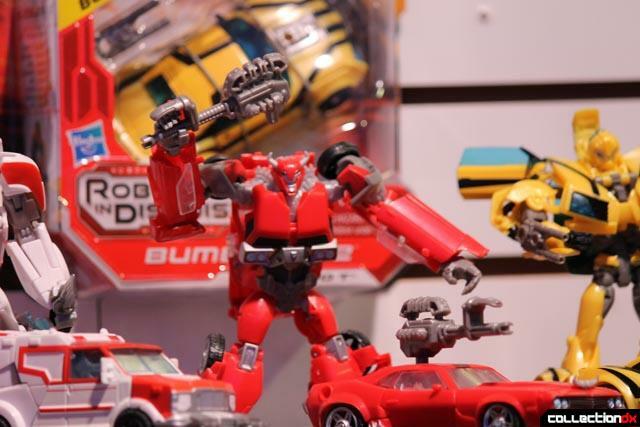 The ultimate in collect ‘em and crash ‘em fun, TRANSFORMERS BOT SHOTS allows fans to choose their power, crash into battle, and beat their opponent. Each character in the launcher assortment boasts a unique deco from the single assortment. Each sold separately. For the most extreme crash-activated battles, we introduce the TRANSFORMERS BOT SHOTS ULTIMATE BATTLE SET. This set comes with two BOT SHOT single figures (BUMBLEBEE and STARCREAM) and two Launchers and figures (OPTIMUS PRIME and MEGATRON). Unique deco different from other packs. 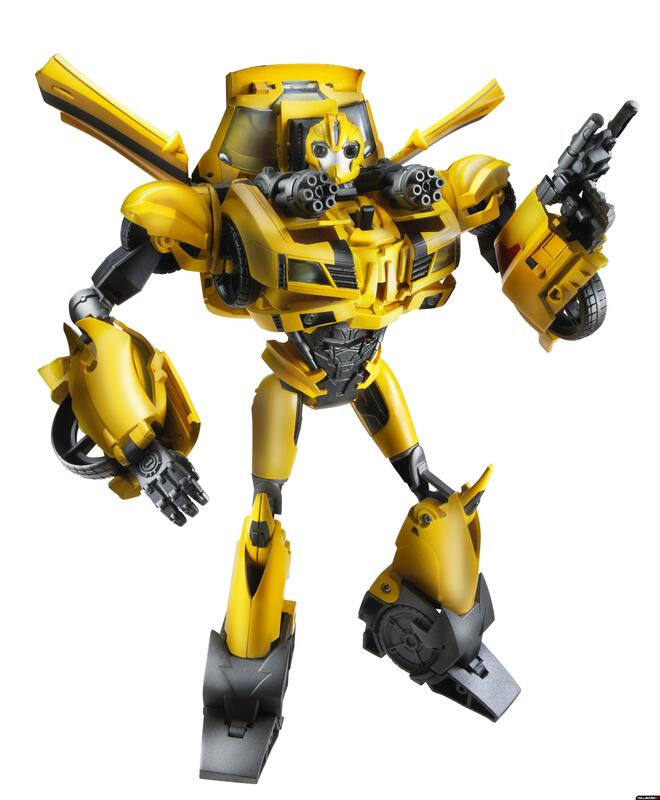 Introducing the TRANSFORMERS PRIME RC Assortment, the remote control TRANSFORMERS figure/vehicle that allows kids to control the conversion from robot to vehicle and back again by remote. With three exciting channels, fans can battle their friends as their favorite TRANSFORMERS characters go head-to-head in battle. 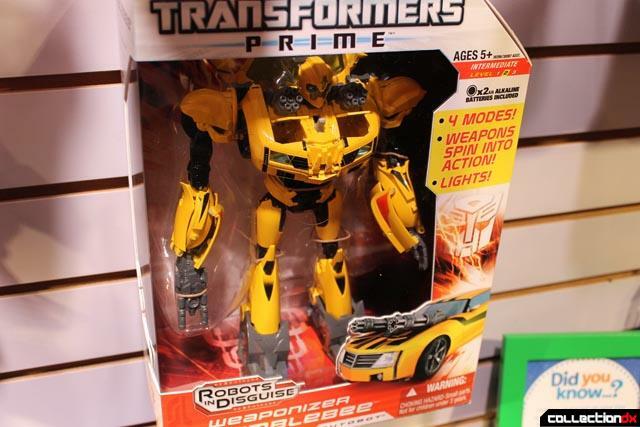 Each TRANSFORMERS PRIME RC is sold separately (one figure and one controller) including BUMBLEBEE, OPTIMUS PRIME and KNOCKOUT. Batteries not included. The TRANSFORMERS PRIME WEAPONIZERS Assortment contains all new TRANSFORMERS PRIME-styled figures from Hasbro Studio’s hit TV Series in a larger scale. With a huge weapon reveal in both robot and vehicle mode as well as lights, TRANSFORMERS PRIME WEAPONIZERS is the ultimate Prime figure. four modes including robot, vehicle, robot with pop-up weapons and vehicle with pop-up weapons, TRANSFORMERS PRIME WEAPONIZERS are the ultimate in TRANSFORMERS conversions. 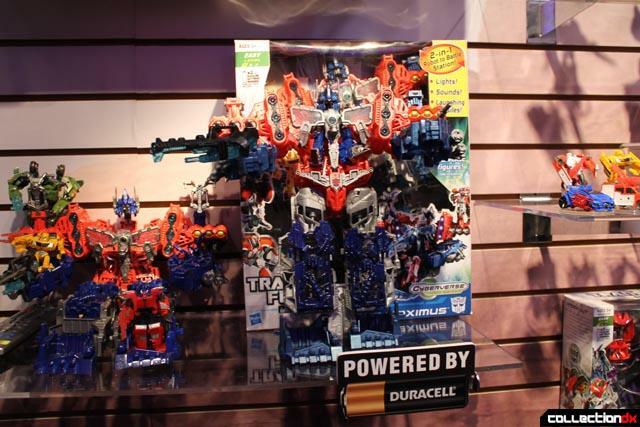 Complete with lights, each action figure, including BUMBLEBEE and OPTIMUS PRIME, is sold separately. The TRANSFORMERS PRIME DELUXE Assortment contains all new TRANSFORMERS PRIME-styled figures from Hasbro Studio’s hit TV Series. 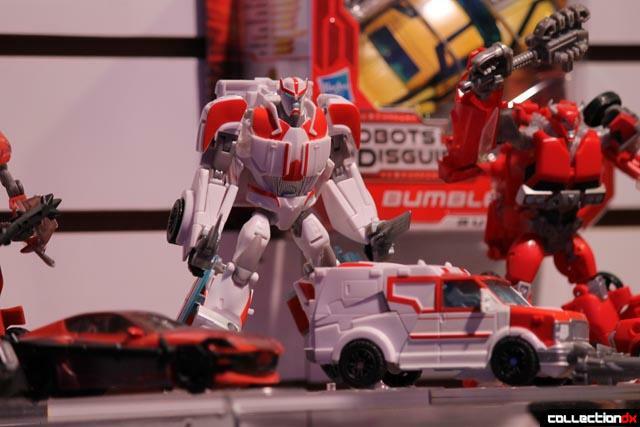 Featuring an intuitive conversion experience, there are 14 characters in the assortment including BUMBLEBEE, WHEELJACK, and ARCEE. Each figure is sold separately and comes with a signature weapon. 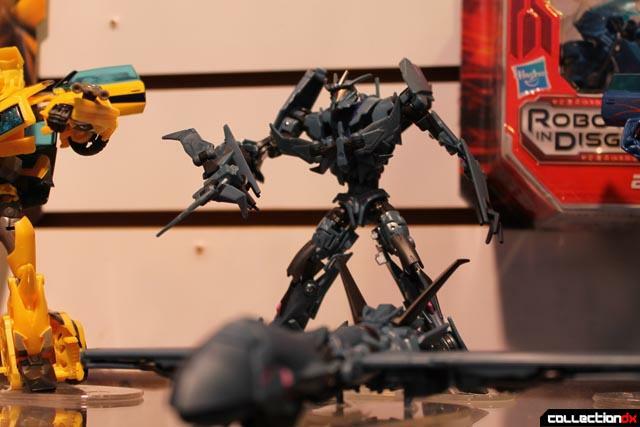 The TRANSFORMERS PRIME VOYAGER Assortment features characters from Hasbro Studios’ hit animated series TRANSFORMERS PRIME and boasts a power-up feature that simulates Engeron from within the figure. 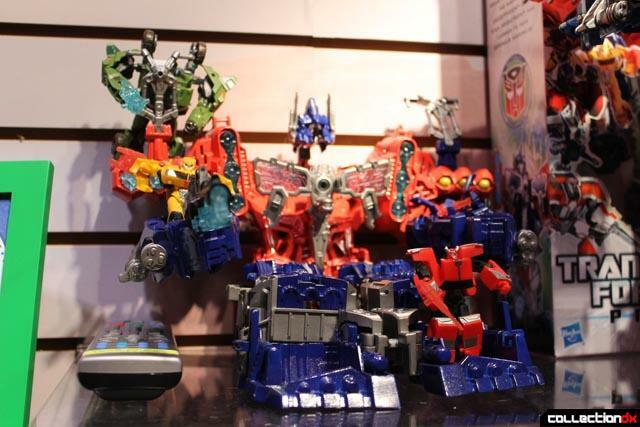 This assortment includes key characters such as OPTIMUS PRIME, BULKHEAD, and MEGATRON in all new prime style. Each sold separately. 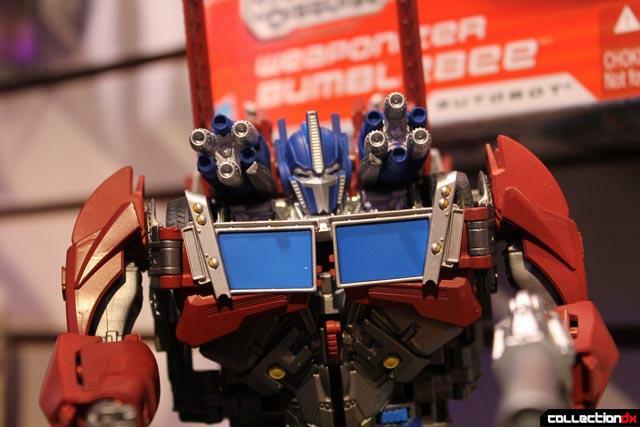 The new TRANSFORMERS PRIME ENERGON HELMET allows kids to become like OPTIMUS PRIME from Hasbro Studio’s hit TV Series! Complete with the characters phrases, conversion sounds and light-up eyes, the TRANSFORMERS PRIME ENERGON HELMET features the ultimate way to become like OPTIMUS PRIME. 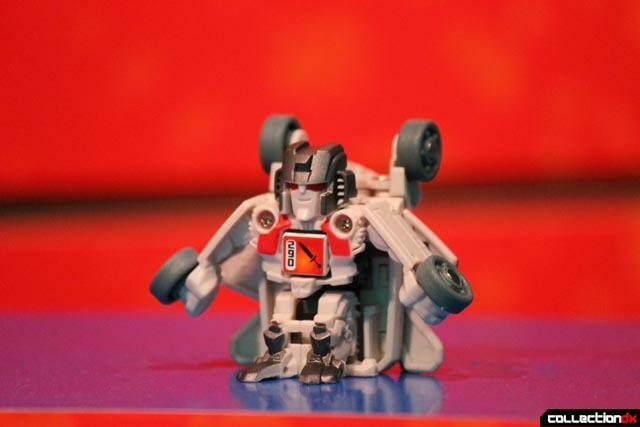 The TRANSFORMERS CYBERVERSE action figure expression, introduced for the first time in 2011, is created in a collectable small scale and features easier robot-to-vehicle conversion than its larger counterparts in the ROBOTS IN DISGUISE line. 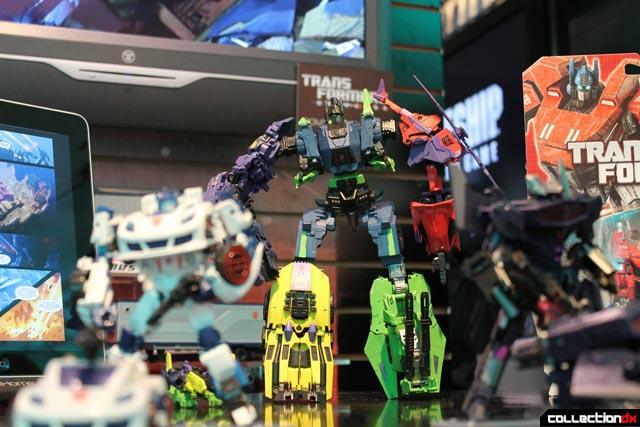 In 2012, the CYBERVERSE line will be available in the style of the hit animated series TRANSFORMERS PRIME from Hasbro Studios. The easier conversion and smaller scale allows kids to change the toys from robot to vehicle and play out the TRANSFORMERS fantasy! TRANSFORMERS CYBERVERSE OPTIMUS MAXIMUS converts from giant robot mech suit to battle station and back again. Each mode features lights, sounds and firing projectiles, enhancing the play experience. Equipped to hold six CYBERVERSE LEGION (sold separately) and three CYBERVERSE COMMANDER figures (sold separately), this figure is a must have for Fall 2012. TRANSFORMERS PRIME CYBERVERSE LEGION CLASS assortment of action figures offers fans the characters from Hasbro Studios’ hit animated series TRANSFORMERS PRIME in two collectible, easy to convert scales. 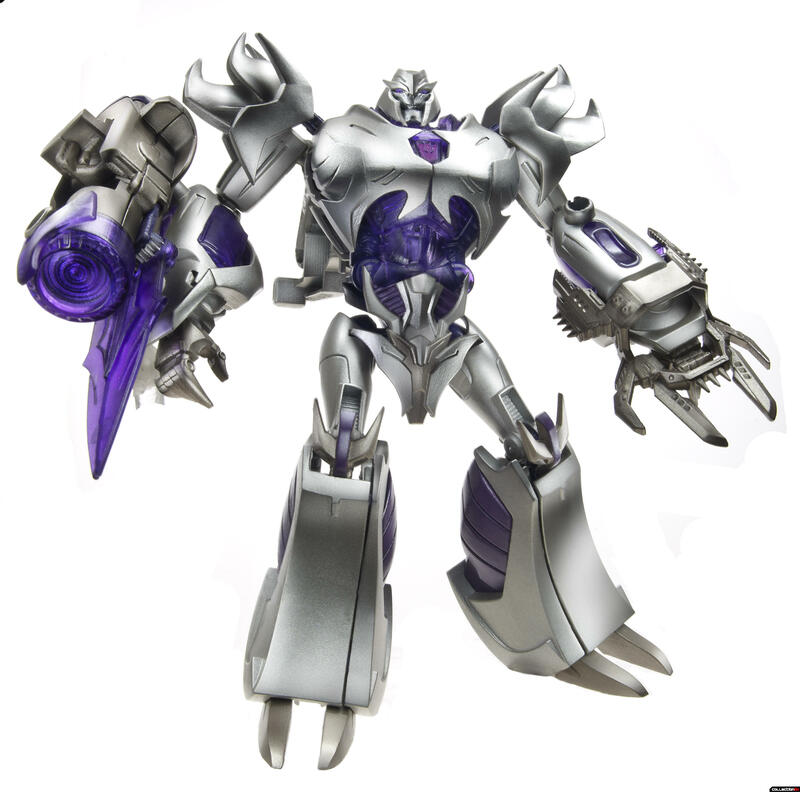 The smallest scale offered within the TRANSFORMERS PRIME CYBERVERSE assortment, the TRANSFORMERS PRIME CYBERVERSE LEGION CLASS ACTION FIGURES come with a clear weapon to showcase the light of ENERGON when plugged into CYBERVERSE vehicles and battle stations (sold separately). 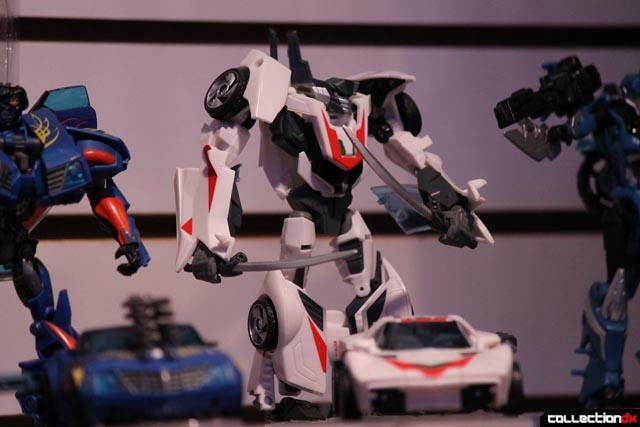 Characters include BUMBLEBEE, ARCEE, and RATCHET. Each figure sold separately. TRANSFORMERS PRIME CYBERVERSE LEGION CLASS assortment of action figures offers fans the characters from Hasbro Studios’ hit animated series TRANSFORMERS PRIME in two collectible, easy to convert scales. The largest scale offered within the TRANSFORMERS PRIME CYBERVERSE assortment, the TRANSFORMERS PRIME CYBERVERSE COMMANDER CLASS ACTION FIGURES each feature clear parts and come with clear weapons to showcase the light of ENERGON when plugged into CYBERVERSE vehicles and battle stations (sold separately). 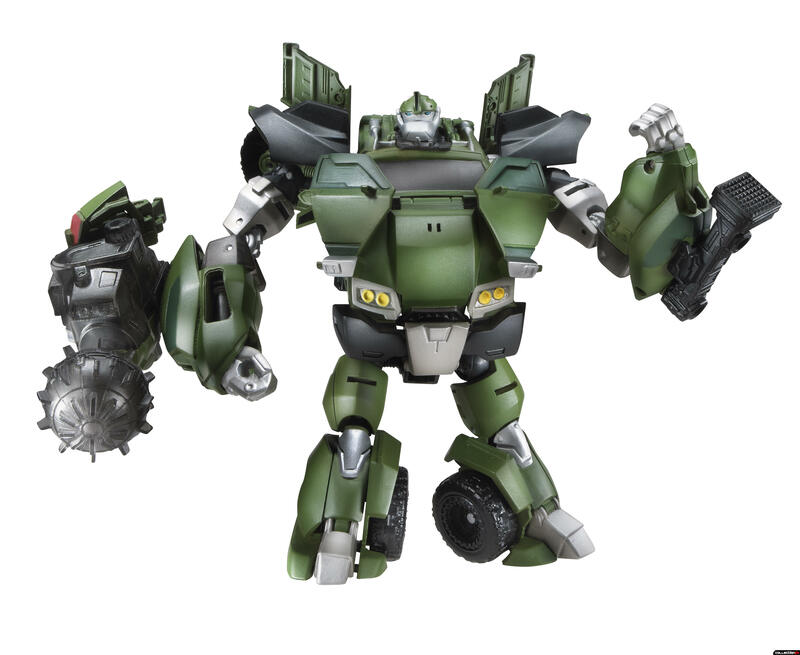 Characters include MEGATRON, OPTIMUS PRIME, BULKHEAD and STARSCREAM. Each figure sold separately. Straight from the hit Hasbro Studios animated program TRANSFORMERS PRIME, each TRANSFORMERS PRIME CYBERVERSE VEHICLE includes an exclusive TRANSFORMERS PRIME CYBERVERSE LEGION CLASS ACTION FIGURE. This assortment is the capstone to the Cyberverse world with a light up feature to bring the glow of ENERGON to LEGION and COMANDER figures and weapons. Changes into battle mode with the push of a button and includes firing missile! 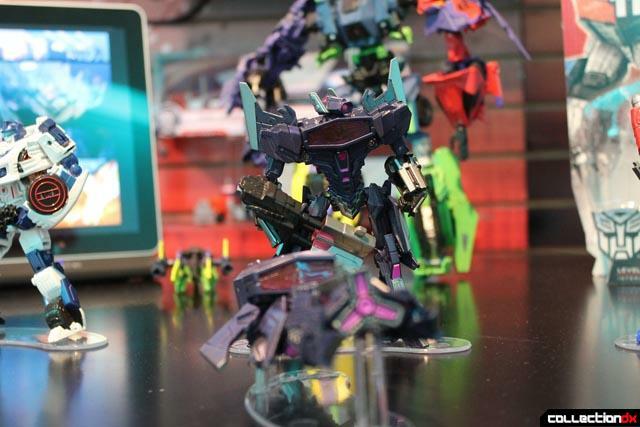 Plus, each vehicle is compatible with every TRANSFORMERS PRIME CYBERVERSE LEGION CLASS and COMMANDER CLASS ACTION FIGURE. Available in STAR HAMMER with WHEELJACK and ENERGON DRILLER with KNOCKOUT. Each sold separately. The TRANSFORMERS GENERATIONS DELUXE Assortment features Transformers characters and designs from throughout the history of the TRANSFORMERS brand. Wave one of the 2012 TRANSFORMERS GENERATIONS DELUXE assortment includes action figures in the ‘CYBERTRONIAN’ style as seen in the eagerly anticipated video game TRANSFORMERS: FALL OF CYBERTRON from Activision. 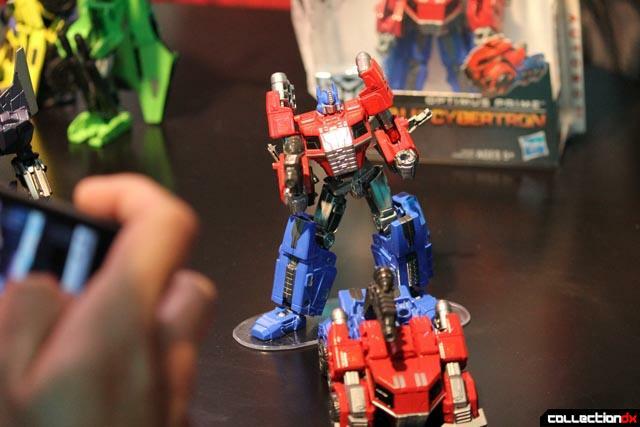 Wave one includes OPTIMUS PRIME, JAZZ and SHOCKWAVE characters. Each sold separately. The TRANSFORMERS GENERATIONS DELUXE Assortment features Transformers characters and designs from throughout the history of the TRANSFORMERS brand. Wave two of the TRANSFORMERS GENERATIONS DELUXE assortment includes action figures in the ‘CYBERTRONIAN’ style as seen in the eagerly anticipated video game TRANSFORMERS: FALL OF CYBERTRON from Activision. Wave two includes BLAST OFF, VORTEX, DECEPTICON BRAWL, SWINDLE, and ONSLAUGHT characters that can combine into one fearsome DECEPTICON, BRUTICUS, just as they do in the game! 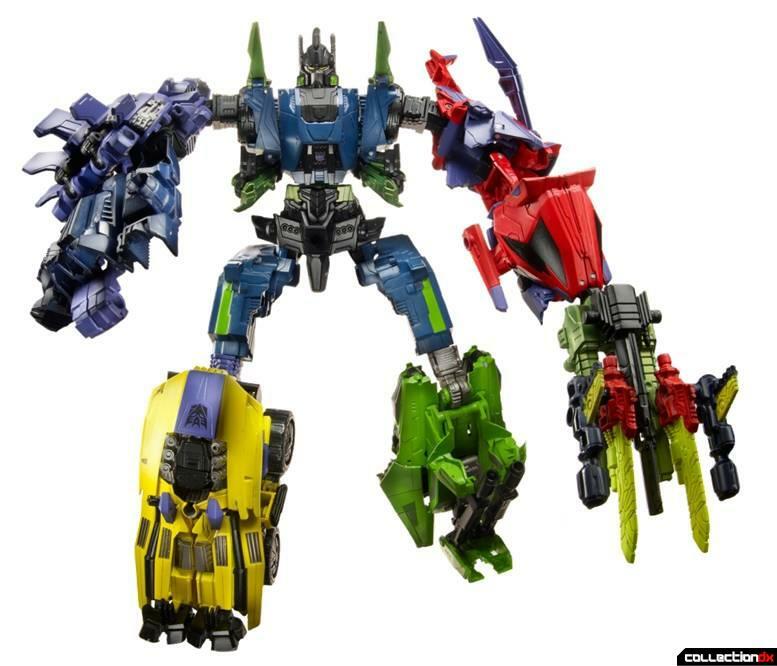 Each figure within the assortment has three modes: robot, vehicle and a third ‘combiner’ mode to link together and form the imposing BRUTICUS figure. Each sold separately. 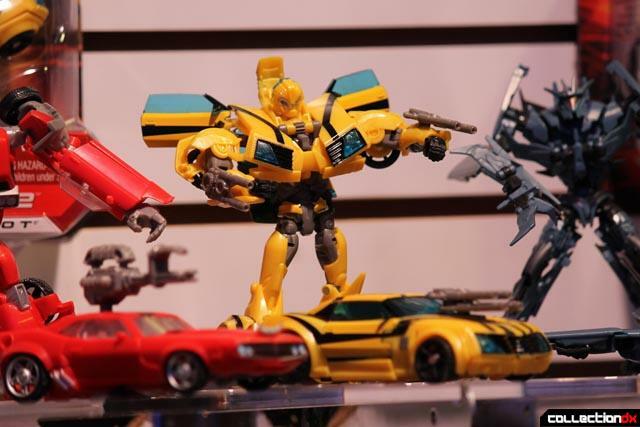 Check out the Transformers 2012 Toy Fair Hasbro Press Image Gallery for pictures of all the products listed above.